Frequent readers of this blog will recall that I highlighted a stunning design flaw in the Nonda Zus Smart Tire Monitoring System. The flaw is that the sensors that mount on the valve stems are subject to galvanic corrosion. That leaves them stuck on the sensors and in my case, I had to take my SUV to a tire shop to have two of the valve stems cut off. That led to me pulling my recommendation of the product which is something that I rarely do. If I get something back from Nonda, I will update this post accordingly. Including, if they plan to roll this out to existing users of the product as well as those who have had issues with the product. Hello. We are still working on improving the ZUS STSM's sensors, and we will make an announcement once an update has been made on the hardware and once they are ready. Thank you. You can bet that I will be holding them to that. Interesting that they didn’t answer the question though. Read into that what you will. Interesting… even if they go internal, you'd have to switch out the tires at least once a year to replace the battery IN the sensor, right? Hopefully they get it right this time. Yes. We estimate the battery life to be 1+ years. It is calculated based on 3 hours of driving per day. Actual lifespan may vary depending on environmental temperatures. The way I read this, the person behind the Nonda Twitter account essentially confirmed that the company is working on INTERNAL sensors. The fact that whoever controls their Twitter account isn’t walking back the fact that internal sensors are in play is significant because either that person isn’t in the same meetings with “Julieta” to make sure that they’re both on the same page, or one of them is communicating “alternate facts” to the public. Perhaps they might want to get together and get on the same page as these two are not helping to put this to bed. It will be interesting to see what they reply with. 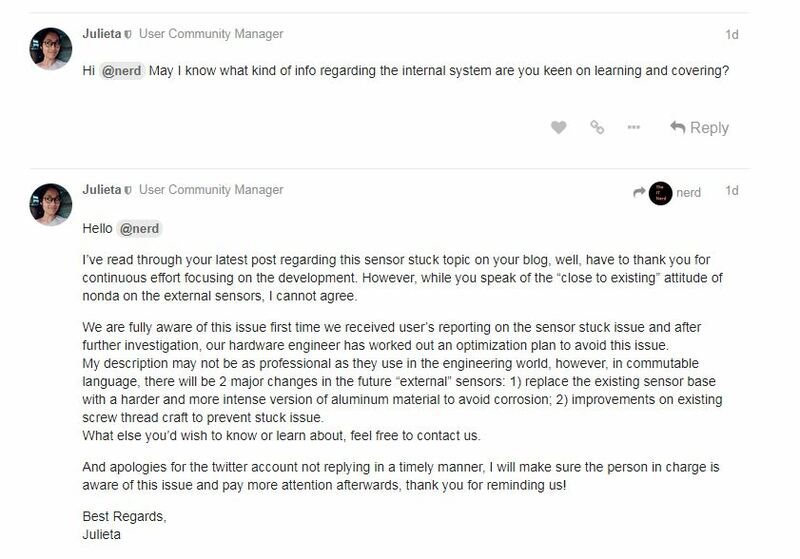 So I think they’re hoping that by telling existing owners to use dielectric grease to keep the sensors from being fused to the valve stems, that they won’t have to go through the expense to replace the sensors that are in the field with an upgraded model that (hopefully) doesn’t have this issue. I’m not sure if that’s such a smart idea given what has gone on to date. I think that Nonda may regret this decision when this problem doesn’t go away. I say that because those who buy this product will not get this advice about using dielectric grease and then get into this situation. They then will not be happy when they discover that this is a known issue, but they didn’t get the advice upfront about the dielectric grease prior to the initial install. Not only that, but they will be even less happy when they find out that Nonda came up with an upgraded sensor and didn’t proactively get them into the hands of existing users. I guarantee that this will not end well for Nonda. I think I’ll sit back and watch what happens next. UPDATE: There’s a new development in this story which is available to read here. This entry was posted on April 4, 2018 at 12:41 pm and is filed under Commentary with tags Nonda. You can follow any responses to this entry through the RSS 2.0 feed. You can leave a response, or trackback from your own site.